I used China Glaze Breakin' as a base with OPI OPI Ink sponged on the tips. I added a layer of China Glaze Temptation Carnation to blend it all together. 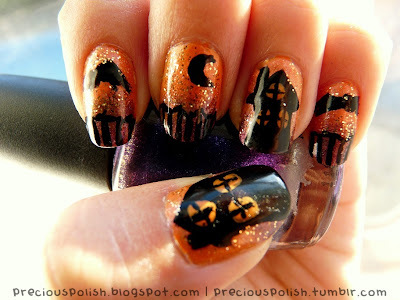 I used a black striping polish for the design and China Glaze Liquid Leather to fill in the houses. Finally I added Love & Beauty Gold Dust Glitter on the background parts. And here's the matching video tutorial! Hope you like it!